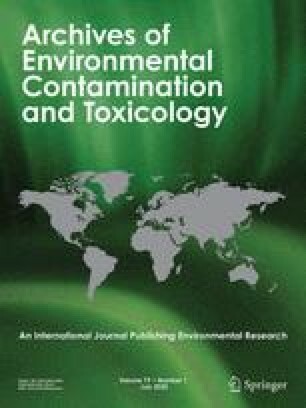 Uptake and elimination rates were determined for chlorpyrifos (CPF) and pentachlorophenol (PCP) in the freshwater amphipod Gammarus pulex. Internal concentrations of the two pesticides were measured over a three-day exposure phase and a subsequent three-day elimination phase. Rate constants were obtained by fitting measured internal concentrations to a one-compartment single first-order model. The uptake rate constants were 747 ± 61 [L kg−1 day−1] for CPF and 89 ± 7 [L kg−1 day−1] for PCP. The elimination rate constants were 0.45 ± 0.05 [day−1] for CPF and 1.76 ± 0.14 [day−1] for PCP. The resulting bioconcentration factors at steady state were 1660 and 51 for CPF and PCP, respectively. The parameter estimation method and possible variability due to varying lipid content are briefly discussed. This work was funded under the EU framework VI programme, project number SSPE-CT-2003-501997 (HAIR: Harmonised environmental Indicators for Pesticide Risk).